Rice pudding has quickly become one of my favourite desserts. With a dense, luxurious texture and rich, creamy flavour it’s difficult to find anything negative to say about it. Some proclaim to dislike its texture, but that’s probably because they haven’t had the right rice pudding. 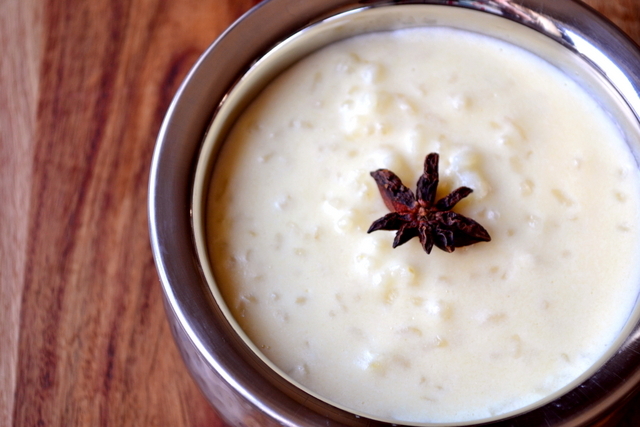 This recipe for Spiced Rice Pudding is the right one. Containing only milk, sugar and rice at its most basic, rice pudding is as close to a blank canvas for flavour as you’re likely to get. Even adding just a little golden syrup and nutmeg to the recipe confers a great deal of taste to the pudding rice. 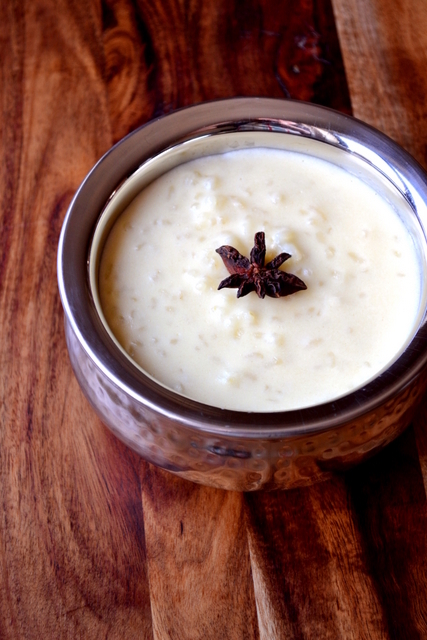 Infuse your milk with some whole spices, however, and you’ll be entered into a whole new dimension of flavour. It’s subtle but obvious at the same time. With an underlying sweetness that’s simply perfect for the end of any meal and particularly appropriate following a hot, powerful curry. Best thing of all? Rice pudding is unbelievably frugal. Some rice, butter, milk, sugar and whole spices is all you need. Even if you decide to use top-quality ingredients – and I recommend gold top Jersey milk if possible – this is dessert at its most economical. Enjoy! Place the whole spices in a large pan and top up with the milk. Bring to a gentle simmer before removing from the heat and leaving to sit until cool. Remove the whole spices and tip in the butter, rice and sugar and bring to a gentle boil. Allow to simmer for 30-40 minutes, stirring occasionally. Serve once thick, creamy and soft through with a little decoration or nutmeg. Cost: Don’t let the memories of rice pudding at school put you off, this is truly an exceptional dessert. And at £1.20 for the lot, you’d be mad to miss it! One of mine too, a true classic. This looks gorgeous! I often make rice pudding because it’s such a quick, satisfying comfort food but I’ve never made it with spice-infused milk before. I’ll be trying out this recipe very soon! Thank you! Please do give it a whirl. It’s also great with golden syrup if you see my other recipe. I’ll be doing a baked version next. Mmm, I love rice pudding! I am going to have to give this a shot next week! Yes! Please do – it’s a truly delicious recipe. I like the warm spices in this, Nick. For my last rice pudding I stirred in some dried sour cherries and some leftover mascarpone after the pudding was cooked — delicious. That sounds nice. I’ll to try it with some mascarpone! Thanks for the tip. Do you leave the whole spices in with the rice while it’s cooking or pull them out before? My girlfriend pointed that out just before you did – the recipe has been changed. Love rice pudding, have not had since I was a little girl. Brings back good memories. You need to make some – so simple and really delicious if done right. I’ll have to check it out – thanks! Thank you! Simple but effective I think. 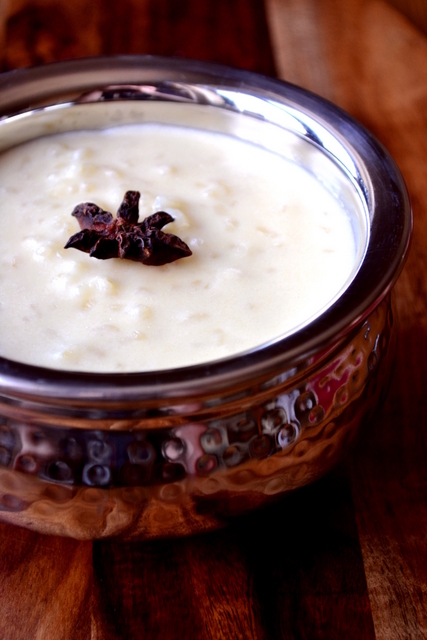 I adore rice pudding, and I love the idea of the spices! Nice bowl too! Thanks – I found the bowl the other day. Just had to buy it. well done – it’s beautiful! This looks completely delicious. Beautiful photos. 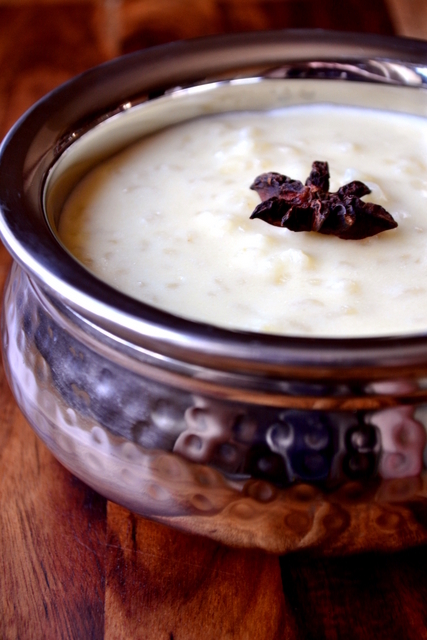 My kids love rice pudding – I will be trying this! Thank you – great to hear your kids like it. Usually, it seems, they don’t like the texture at all. Thank you – wholesome, but still a wonderful pud! Thank you for posting this; I gave it a whirl today. My thirteen year old, who usually turns her nose up at homemade rice pudding, absolutely loved it. It’s definitely going to be a family favourite! So glad! I think the spices really help. Thank you! I’m going to do a baked version soon.